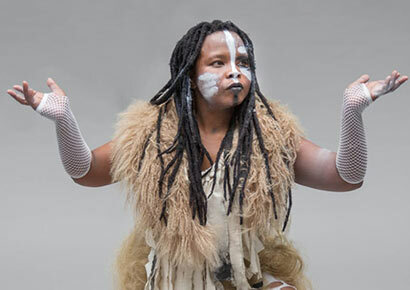 Internationally renowned South African performance artist, activist and academic Kieron Jina has joined forces with some of South Africa and Germany’s most talented artists in a creative collaboration titled The Rise of the African Queer. The Rise of the African Queer, supported by the National Arts Council, will see Jina team up with Johannesburg and Berlin based performance artists, fashion designers, sound designers, filmmakers, activists, dramaturg, stage and lighting artists to collaboratively create an ascendance of the African Queer narrative at the closing event of the newly re-launched Dance Umbrella Africa at the State Theatre in Pretoria. The process of being photographed or video recorded as a queer person is a language and a key entry point for this creation; questioning the social constructs of alienation, ‘coming-out’ and perceiving the future. African literature, physical body language, video projections, and experimental sounds are mediums that were used to produce this show. It’s a new work made in collaboration with Anelisa ‘Annalyzer’ Stuurman, Yogin Sullaphen, Roman Handt, Tobias ‘Akrobat’ Purfürst, Sean Mongie, Wilhelm Disbergen, Joni Barnard, Shalom Mushwana, Negiste Yesside Johnson and Alyssa Rivas. “Being ‘Femme in Public’ is a choice I have made to celebrate who I am and what makes me feel alive. We live in a very chaotic yet beautiful world of shaming people for being who they are. I am queer and a person of colour from Africa who has made a choice to create space for marginalised narratives and re-write herstory,” Jina adds. The Rise of the African Queer will premiere as part of Dance Umbrella Africa 2019 at the Momentum Theatre, at the South African State Theatre, on the 7th of April 2019 at 18:30. Tickets (R100) are available at Webtickets.co.za (Limited seating). The full Dance Umbrella Africa Program 2019 is available here (PDF).